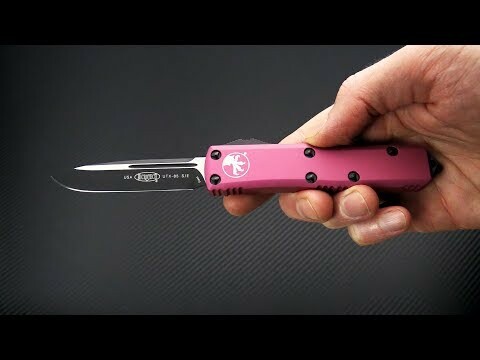 The UTX-85 (15% smaller than an Ultratech or 85% the size of one) dual action out the front automatic knife from Microtech makes an even friendlier every day carry option. This version has a Pink contoured handle with black hardware and a two-tone, black coated ELMAX Drop Point blade. Blade: Equipped with a two-tone finish, the drop point has a plain "standard" cutting edge. The drop point is highly utilitarian and made from edge retaining ELMAX blade steel. The blade has satin flats and spine contrasting nicely with the black Cerakote coating on the grinds, swedge and fullers. The +3 inch blade features a double action operation for fast, smooth action in use. Simply move the thumb slide on the side of the handle up to deploy and down to retract. An internal spring remains at rest in both the open and closed position to reduce wear. Bohler Elmax: Elmax has become an extremely popular choice for high-end user grade knives thanks to its extreme edge retention. Elmax also has a good corrosion resistance, meaning most users can avoid corrosion (rust) by simply wiping off their blade after each use. Another great feature of this steel is its ability to resist burr formation during sharpening. Elmax has very similar performance to M390 and is used interchangeably by Microtech.